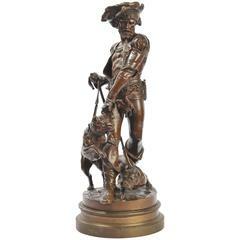 A very dramatic bronze statue, depicting a 19th century Houndsman with his two hounds. Revolves on a bronze socal base. Henri Honoré Plé was born in Paris on March 8, 1853. He died in the same city on January 31, 1922. He was a student of Gerault and Mathurin Moreau. He began exhibiting at the Salon in 1877. He was made a member of the prestigious Societe des Artistes Francais. From 1877 until 1900 he actively exhibited and won several medals and prizes including a bronze medal at the 1900 Exposition Universelle. He received public and private commissions including one for a City Hall statue in Paris and another in Compiegne. In the US one of his bronzes is in the collection of the St. Louis Art Museum. 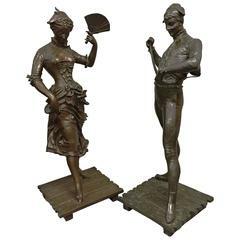 Pair of good quality bronze studies by P. Dubois, depicting a Harlequin and Columbine. An Art Deco, patinated bronze study of a prowling tiger, set over an integral marble base. Signed to marble. Henri Georges Adam, 1904-1967. Unique piece, stamped 0/0, signed Adam, foundry signature: Susses Frères Paris, circa 1950-1960.